Delivering the opening address, CMA Sri Lanka President Prof. Lakshman R. Watawala highlighted the importance of TCM and the role of CMA in implementing TCM within the industry in order to achieve competitiveness and efficiency. “Cost is embedded in all areas of activity. If the cost goes up then the consumer has to pay for it. In the case of exports, if we are not competitive then we will lose the market share to low-cost countries. If cost is increased without a corresponding increase in productivity then manufacturers, services and state institutions will be put into great trouble. Therefore not only professional accountants but also professional managers are required both in the private and public sector to properly manage these organisations,” he said. Watawala added that keynote speaker Prof. Ho Yew Kee’s address would encourage us to follow a path which would enable Sri Lanka to fast-track economic development. Prof. Watawala also commended the efforts of the companies that submitted reports this year, stating that integrated reports had shown a major improvement when compared with the previous year. Delivering the keynote address on ‘Total Cost Management in the Development of the Economy – Singapore Experience’, National University of Singapore Department of Accounting Head Prof. Ho Yew Kee outlined how the “backwater village” was turned into one of the 21st Century’s leading global cities. Noting that it took 51 years for Singapore to achieve its current success, Prof. Kee outlined six of its key contributing factors, which consisted of a stable and efficient government, meritocratic manpower, a stable market-driven economy, the pursuit of excellence, investment priorities (especially in education and infrastructure) and confronting a changing world. In addition to these factors he also mentioned four key softwares which comprised of vision and mission, reality of survival (where are we now? ), crafting a way forward and the execution and measurement of success for developing the economy. He said it was critical to share a common destiny regardless of economic class, race and religion, which he stressed was one of the most challenging factors for many economies in the world today. He defined TCM as the effective application of professional and technical expertise to plan and control resources, costs and profitability or a systematic approach to manage cost throughout the lifecycle of any enterprise, program, facility, project, product or service. Listing the challenges and way forward for his country, Prof. Kee said that as the world developed there was a possibility that trade routes would move out of Singapore. He added that no country or city had ever survived when trade routes had changed. “We used to be a production hub but we have been replaced by Vietnam, Laos, Cambodia and China. The next step for us is to become a pharmaceutical hub and an air hub,” he explained. He pointed out that the Government was investing $ 1.08 billion to build the fifth terminal at Changi Airport called the Jewel Project, which will be completed by 2018. “This is a significant project for us in reinventing the trade routes to ensure that our trade routes will never ever bypass us. With the completion of this terminal we want to convert the airport into a major air hub where no budget or international airline will bypass Singapore,” he added. Furthermore, Prof. Kee identified the evolution of technology and graduate employment as major challenges. “Technology has evolved so much that accountancy will soon be replaced by artificial intelligence. Traditional accountancy no longer exists,” he asserted. Noting that Singapore was not afraid of everything under the sun, Prof. Kee stressed the importance of looking to the future with a sense of urgency while considering changes in terms of trade routes, the environment, climate, potential investment, the attitudes of the youth and social values. Chief Guest Industry and Commerce Minister Rishad Bathiudeen said that CMA in Sri Lanka needed to be given due recognition and legal support to implement structures and procedures for essential industries and services to have proper systems of cost accounting records which would assist the management in this process. He said the management accounting profession had gained greater significance in the post-recession global economy where “big four accounting firms” as well as other accountancy firms had increased their recruitments, thereby increasing the demand for accountants worldwide. According to global manpower recruiters, among the leading countries that supplied accountants to the global accountancy market during the last two years were Ireland, South Africa, Zimbabwe, Ghana, Canada, Cyprus, Romania, Brazil, Argentina, Mauritius, Philippines and Malaysia. 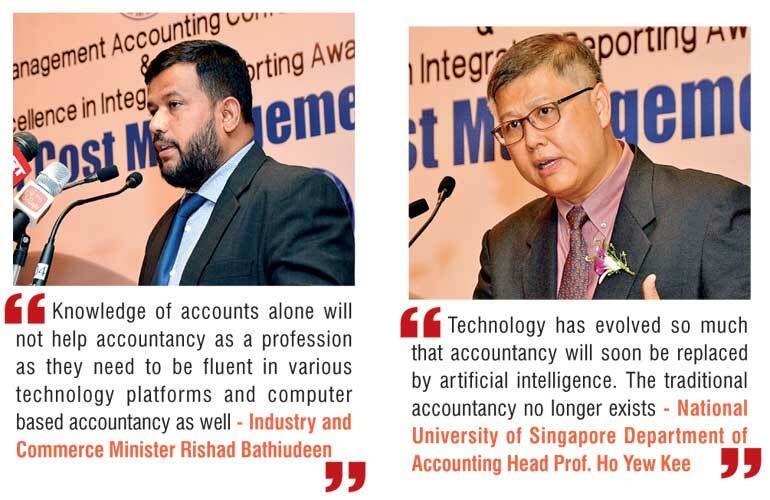 Considering rapidly evolving global trends, he said that knowledge of accounts alone would not help accountancy as a profession as accountants needed to be competent with various technology platforms and computer-based accountancy as well. 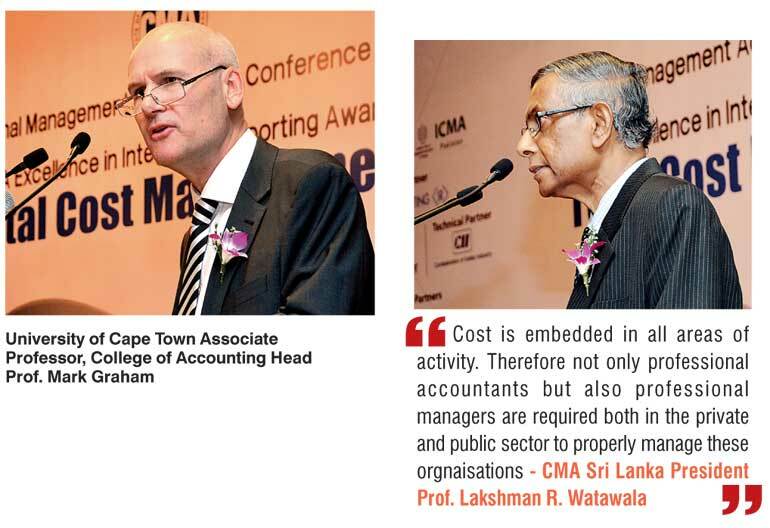 While commending CMA Sri Lanka for partnering with CII-TCM India to launch the Total Cost Management (TCM) Program, which will enable businesses to enhance their cost competitiveness, he also lauded CMA for conducting the ‘Excellence in Integrated Reporting Awards’ for the second year, noting that it would be beneficial to investors and stakeholders due to the insight provided into organisations’ strategies. Presenting the judges report, Associate Professor and Head of College of the Accounting University of Cape Town, Prof. Mark Graham said the selection was carried out according to the guidelines applicable to the International <IR> Framework issued in December 2013 by IIRC. He said the 10 best integrated reports and the overall winners were selected by a panel of five local and foreign judges. The ‘CMA Excellence in Integrated Reporting Awards 2016’ was held yesterday in conjunction with the conference’s inauguration. DIMO Plc secured the top award for CMA Excellence in Integrated Reporting, followed by JKH in second position and LB Finance and Mercantile Finance Plc who were tied for third. Meanwhile, Finance Minister Ravi Karunanayake, Auditor General H.M.G. Wijesinghe, KPMG Managing Partner Reyaz Mihular, Infotechs Ltd. Managing Director S.K.S. De Silva, Ernst and Young Partner Devaka Cooray, NSB DGM Finance and Planning’s K.B. Wijeratne, A Baur & Company Ltd. Director Finance Jayendran A. Setukavalar, PE Management Constructions Ltd. Director A.T.P. Edirisinghe and KPMG Former Partner S. Sirikananathan won CMA Professional Excellence Awards for 2016. The technical sessions will be held today and tomorrow and will feature eight technical sessions with two panel discussions and a total of 40 eminent speakers and panellists from Sri Lanka and abroad. The conference caters to directors, CEOS, Management and financial accountants, managers and executives in Marketing, IT, Human Resources, Banking, Finance, Insurance, the key management of state-owned enterprises, lecturers of universities, technical colleges, professionals and others in industry, commerce, non-profit institutions and professional bodies.